It’s possible that the title of this post is a touch hyperbolic. But then again, not really. It depends on your definition of ace. At this exact moment in time, Porcello isn’t one of the best dozen starters in the game, but he’s quietly turning himself into a top tier arm that could anchor most MLB rotations as a #2 starter, and could slide in as the best pitcher on quite a few teams. Yeah, maybe “ace” is a generous description, but Porcello is very good and will continue to be. I’ve been beating this drum for years, so my apologies if I’ve already won you over, but it demands repeating. Porcello isn’t just a really good #5 starter anymore, he’s a bona fide good starting pitcher. He might even be arriving as a star. Let’s cover some of the particulars. 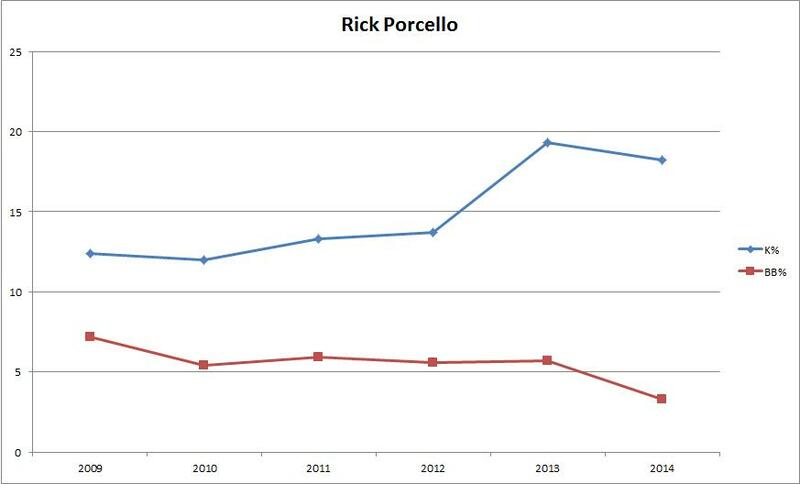 Porcello was good enough in his first two seasons (09-10), was a little better in (11-12), and then broke out in 2013. He’s consistently been worthy of an MLB job, but he went from solid backend guy to legitimate building block over the last couple of years. He went from a low strikeout, high ground ball guy to an average strikeout, high ground ball guy. The big leap in strikeouts in 2013 pushed Porcello forward. And he’s sustained that improvement in 2014 while also slicing his walk totals to Cliff Lee-ian levels. Take a look. 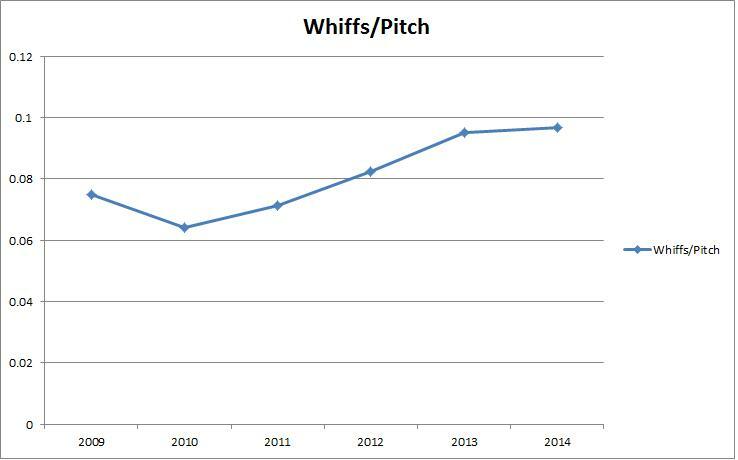 His FIP and xFIP have improved in each of his six seasons and his ERA has improved in each of the last five. This year, he’s also limiting the damage against lefties, cutting his wOBA against them by something like 70 points so far. Some of this is also about context. Porcello has thrown up (essentially) three straight 3.0 fWAR seasons (we always use FanGraphs WAR here, if you’re new) and is on pace for something more like 4.0+ WAR this year. Granted, we’re only about 15% of the way through the season and he probably won’t really only walk 3.3% of hitters, but the gains he made last year seem like they’re here to stay. Take a look at his swinging strikes per pitch over his career. The case against Porcello, of which there are a number of advocates, fails to consider three important things. First, as hard as we try to change things, ERA still comes first for most people and Porcello has had inflated ERA’s in the past because he played in front of bad defenses. He allowed a lot of singles because no one could get to the ball. This year, in front of real defenders, he has a career best batting average against (.239), WHIP (1.00), and BABIP (.272). He’s not doing a whole lot differently, but his defense isn’t letting the ball get through as easily, which is helping keep that ERA in check. Another thing to consider is that just because Porcello has been around forever, doesn’t mean he’s immune from normal expectations. Jose Fernandez like dominance at 21 is extremely rare. Porcello was big league ready at 20, but that doesn’t mean he was done developing at 20. He’s worked on things and improved over the course of his career, but he’s only 25. Justin Verlander’s age 25 season was his third full year. It will be Porcello’s sixth. Justin Verlander was a 3-4 WAR guy from ages 23-25. From ages 26-29, Verlander was a 6-8 WAR pitcher. I’m not saying Porcello is Verlander, but it’s not crazy to say that he’ll get better into his late 20s. Pitchers peak as they approach 30 and Porcello isn’t anywhere close. Beyond that, Porcello is simply overshadowed. Tigers fans are spoiled. We think it’s normal to have Verlander AND Scherzer AND Sanchez AND (at one time) Fister. That’s not normal. Most teams have one guy who can get into that conversation. The Tigers have had 3-4 aces over each of the last four seasons. That’s ridiculous. Porcello isn’t as good as Scherzer, but you don’t have to be as good as Scherzer to be pretty freaking good. I don’t think Porcello is going to turn into a Hall of Fame arm, but I do think there’s more improvement coming. Last year, he added a curveball to help him add strikeouts. This year, he found a way to make use of a slider that had previously been terrible. He’s making better use of his swing back fastball (see below) and he’s finding the right moments to dial up at blast 94-95 by batters. People have been predicting the Porcello leap forever, but I hate to break it to them, the breakouts have been happening. He has taken many steps forward over the years but they were hidden by rough defense and the occasional blow up outing. This year, he’s locked in. Maybe it’s maturity or experience kicking in, maybe Avila and Jones figured something out, maybe he didn’t like Leyland’s secondhand smoke. I’m not totally sure. For crying out loud, small sample size and such understood, he has the same K% as Verlander right now. For a variety of reasons, Porcello’s own fans haven’t appreciated the development. But when you examine the body of work, he’s actually on a great path. The Tigers have him for one more season (through 2015). For all the talk about Scherzer’s extension, Porcello is the guy they should be chasing. 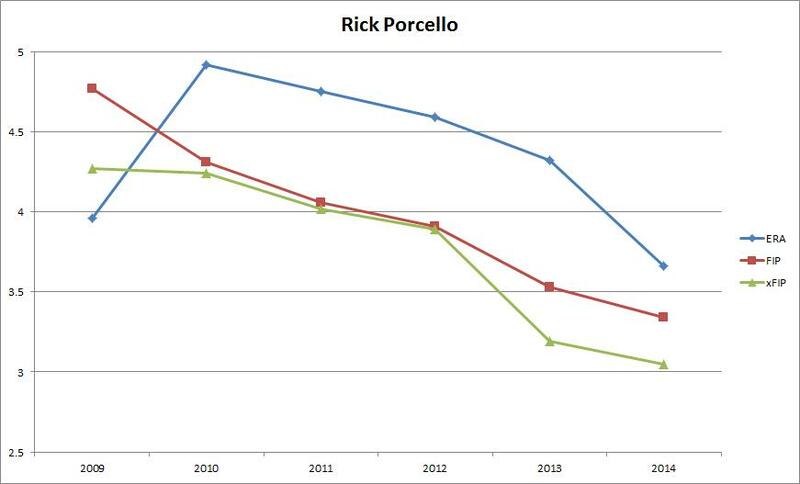 He’s not as good right now, but Porcello is going to get better and Scherzer is going to slowly decline as he ages. The best extensions are the ones for guys in the their 20s, not their 30s. You bet on the guy trending up and Porcello is definitely in that class. It may be difficult to look at a guy who’s the fourth best starter on his team and think he’s terrific, but that’s only a problem because he happens to be on such an historic staff. If he was on the Twins or the Pirates or the Orioles or the Cubs he’d look like a star. Hopefully he’ll be cursed with this perception problem for his entire career and will stay in a Tigers uniform in Verlander’s shadow. He might not be an ace, but we’re at the point where one more little improvement could push him into that conversation.